This alternating Square Knots pattern are commonly seen in Macrame projects, so practice this several times. 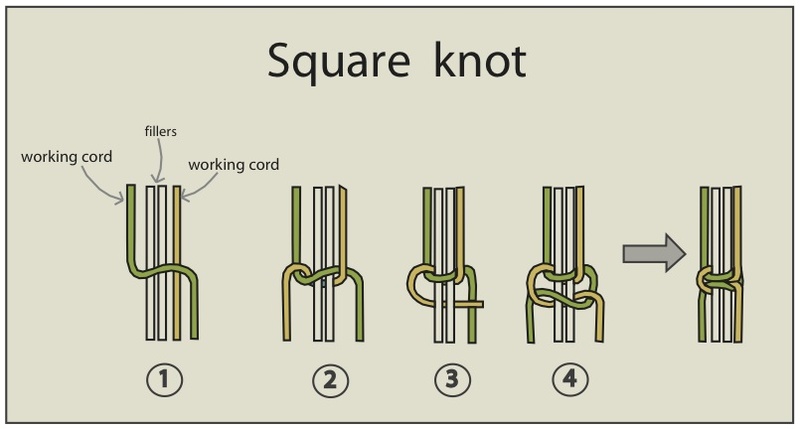 Be sure you practice Square Knots before you get started. You can use 4 cords or more making this pattern. To practice the pattern you saw in picture, you need 8 cords to work with. Secure them to your work surface. Make 2 groups of 4 cords. Tie one Square Knot to each group. left group : cords 1 and 4 are the working cords, with 2 and 3 as the fillers. right group :cords 5 and 8 are the working cords The fillers are cords 6 and 7.
along with 5 and 6 from the right group. Use them to tie the next Square Knot. The working cords are 3 and 6. Continue by repeat this method over and over.